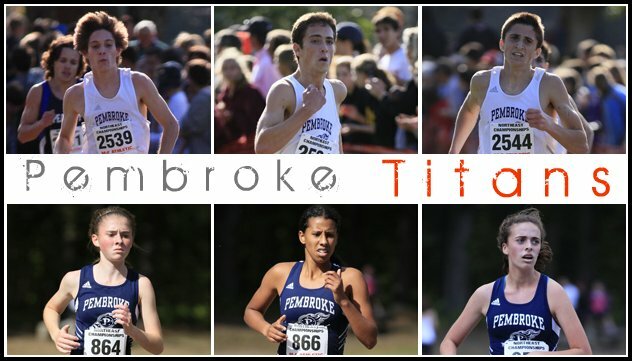 Pembroke clearly likes the Brown invitational. Traditionally, they have used the meet to build momentum heading into the second half of the season and 2011 was no exception. The Titans captured their third straight Boys Northeast Championship Division title, beating US#30 St. Anthony's (NY) by just two points behind some very solid performances across the board. MileSplitMass had the opportunity to catch-up with Head Coach Greg Zapatti and ask him a few questions about their latest win. 1. How would you rate this performance and where does it fit-in with regard to the grand scheme of the season? We’ve won this meet for the last three years and we’ve always felt its timing in our schedule was perfect in determining our fitness level to this point. It’s a meet in which we get to let our hair down a little and really get after it. I thought our performance really reflected upon what we’ve seen in workouts lately. The boys were very hungry coming in and showed that. This performance sets us up for a nice run in November and has given the guys more confidence going into their final phase of training. 2. What is your evaluation of the different components of the team today? Did things go as planned? I thought our top 4 ran outstanding races especially our 2-4 running together for much of the race. Christian Stafford dropped a bomb and showed his monster talent when up against elite competition. Team Captain Joe Vercollone really ran what might be his best XC race of his career. Sophomore John Valeri had a very nice day, and would have been the fastest sophomore on the day it if it wasn’t for his teammate. That 2-4 group has been really tightening up over the last 3-4 weeks and realize they are at an advantage out there to have each other. I thought Jesse Fine (usually our 6th man who has been dealing with some hip tendonitis) ran very well for what he’s been through the last few weeks, and that this race will set him up well for the coming weeks. Patrick Cunningham, who has really come on in our practices as our 5th man, caught a stitch at about 1.5K and struggled to finish. He’s very talented and we as a team believe in him and feel that our 1-5 gap will close by November. We know it seems like there is a hole there, but what we see everyday is a 1min gap from 1-5….we’ll get there. I was just as impressed with our JV group winning for the second year in a row. We would like to continue to progress as a team and those guys are a huge part of that. 3. Wes Gallagher finished 3rd overall with a very gutsy sprint over the final stretch. What are your thoughts on his race? I thought Wesley ran a very tough race. Like many athletes of his caliber this week was not a down week, mileage/work wise, and I think that showed through the middle parts of the race where he had to really bear down to hang with Sissay and Hubb. He gave himself a chance over the last 1K and showed his uncanny racing ability over the last 200m. Both Wesley and I were happy with his performance and know the best is yet to come for him and the team. 4. There is a rumor that you drank chocolate milk from the cup of the championship trophy on Saturday. Does it taste sweeter after a big win? Yes, the Chocolate Milk tastes better after a win…a little metallic…but good. I hope that this tradition continues, and even if we don’t win next year, I want to get the opposing coach to drink chocolate milk out of the trophy ala “kissing the bricks” or “Drinking the Milk” in NASCAR.